We watched the weather and tried our best to stay out of the snow and extreme temperatures. 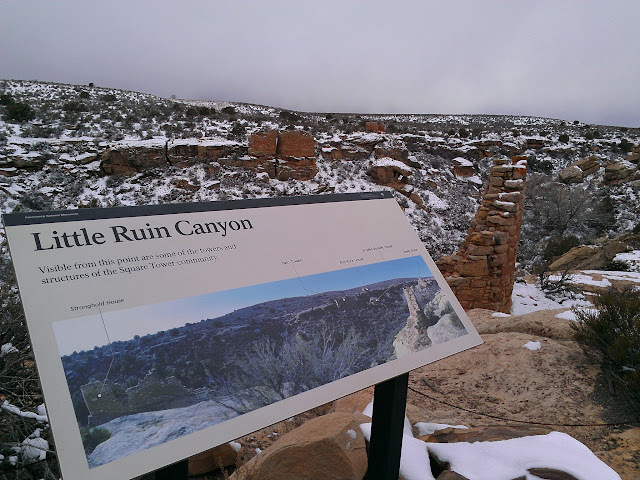 We decided to head toward Hovenweep. We made it to the visitors center late in the afternoon to get some information. It was so cold and windy up there, we decided to head out. Before we did, the ranger told us we should take a 300 ft walk behind the building to where the overlook was for Little Ruin Canyon. We decided to take off for Monument Valley on Thursday morning, but found out that it was $5 each to get in and $12 to camp at the only campground in the park. That would have been fine if it was a better time of year for visiting there. No dispersed camping. Good thing I got a bit of internet before we went the 70 or so miles (round trip) out of our way. Quick change of plan lead us to Sand Island CG. There was a loop road that lead to a huge wall of petroglyphs. We're due in Santa Fe for a house sit on Dec. 14th. We've been trying to kill time for 2 weeks now and still have 8 days to go. It wouldn't be so bad, but it's unusually, bitter cold for this time of year. Although we didn't experience much of a storm at Goosenecks SP, we did have wicked wind Tuesday night and ended up having to move the RV. It came up fast and furious earlier in the evening and we tried to go to bed and ignore it. But, it felt like it was going to shake the RV apart and was doing a number on my nerves. We got up shortly after we went to bed and moved to the other side of the lot. Sam did an awesome job of parking Funji into the wind and, except for some major gusts, we were able to relax a bit.